Hash #966 was on 4th February 2017 and was held at Quik Fix Tyre Centre, Queen’s Park, St. George’s. 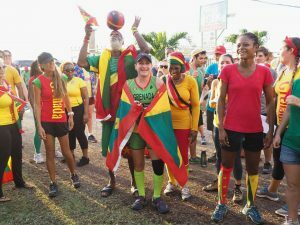 This was our Grenada Independence Day Hash and all or most hashers turned up in all their colours to celebrate. The hare Troy “Double Entry” Felix set three trails, a short walk, a long walk and a runners trail. 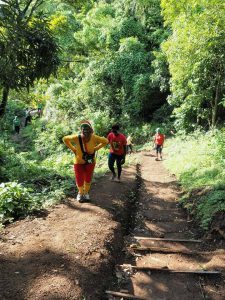 Well, there was no shortage of hills on the runners trail and one steep staircase with 125 stairs to climb – we were calling for the skies to open and cool us down with a nice little rain – no such luck. Unfortunately for “Double Entry” quite a few of the regular hashers recognized 95% of the trail – seems it was almost a duplicate of a prior hash in the area. That little mistake earned”Double Entry” a down down along with the fact that his birthday is on the 8th Feb – he received the Wizards Sleeve and Dotty Potty just to cover all bases. There was a competition for the best dressed hasher (in their colours) and it was a close competition but “Testical” won – by not only wearing all the colours, he carried a flag and while balancing a ball on his head! There was good food and drinks after the hash, thank-you Troy for your efforts.